A new Raspberry Pi just joined the family, descending on the catalogs of selected distributors in late November. The new Pi also appeared as a covermount on the Pi Foundation's MagPi magazine. Newsstands quickly sold out of the magazines, and "Out of Stock" messages started to appear at the distributor websites. Why the sudden run on the market? Because the Raspberry Pi Zero is so little, and so inexpensive: only $5 for a working computer that runs existing Raspbian editions and other Rasp Pi software. And, it works! If you thought the original Rasp Pi was tiny, get ready for something significantly smaller (Figure 1). The new Pi is only 65x30x5mm – which means it occupies a space on the table that is 60 percent smaller than the old 85x56mm Pi editions. Actually, the space needed for plugging in the cables is larger than the Pi Zero itself (Figure 2). On the inside, you'll find a Broadcom BCM2835 application processor with 1GHz core and 512MB of LPDDR2 SDRAM. Figure 1: The Pi Zero is really small, but it's missing some of the ports you've grown accustomed to if you use the Raspberry Pi 2. Figure 2: The cable connections take up more space than the whole computer. In an interview with the Wall Street Journal, Raspberry Pi Foundation founder Eben Upton explained he got the idea for the Pi Zero after talking to Alphabet/Google Executive Chairman Eric Schmidt. "I told him we were thinking of making future Raspberry Pis a little bit more expensive, up at about $50 or $60, and a bit more powerful." Schmidt recommended aiming for a lower cost. "He said it was very hard to compete with cheap. He made a very compelling case. It was a life-changing conversation." After his talk with Schmidt, Upton went back to the lab and "scrapped all the engineering plans for more expensive versions of future Pi computers." According to Upton, "the idea was to make a powerful thing at the same price, and then make a cheaper thing with the same power." We picked up one of the last Raspberry Pi Zeros left from a local distributor outlet and took it for a drive. As most Pi users know, one of the unwritten facts about the Raspberry Pi is that the $35 Raspberry Pi computer is only $35 if you have all the other equipment you need: an old monitor and mouse, an HDMI cable, a power cable, a spare SD card. The same thing applies to the Pi Zero – or even more so since the unit only has one free USB port and no built-in networking. 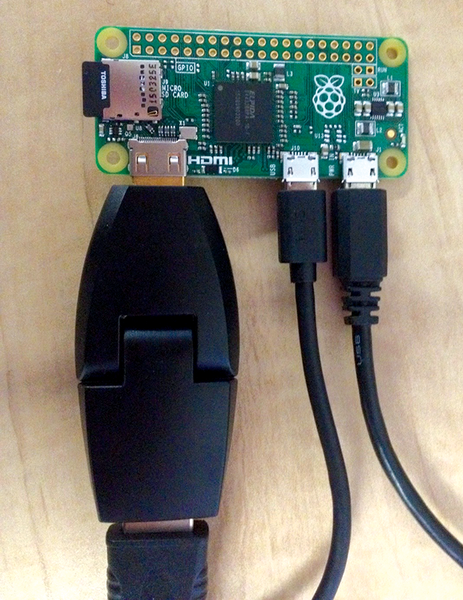 To use your Pi Zero in a basic desktop configuration, you'll need an SD card, a USB OTG ("On the Go") cable, a power supply with USB cable, a WiFi USB dongle if you want to connect to a network, and a powered hub. Adafruit has a Pi Zero Budget pack with many of the extra parts you'll need, although it is sold out as of this writing. The apples-to-apples comparison for the cost of outfitting a Rasp Pi 2 (RPi2) versus a Rasp Pi Zero shows the cost benefit is almost negligible if you plan to use the Pi Zero in a basic end-user setting that requires USB ports and a network connection (Table 1). The more bare-bones you make your system, the more influence the ultra-cheap $5 board has on the total price. In scenarios where the Pi Zero is serving some single-purpose embedded or mechanical role, and you don't need a powered hub or network connection, the lower price becomes more significant. If you are using your Pi Zero in an embedded setting and want to make use of the GPIO system, you'll notice that the GPIO pins are missing from the Pi Zero board. You'll need to solder an add-on GPIO pin header strip to the board to use the GPIO pins. The Pi Zero is a full Raspberry Pi version that runs all the systems you can run on a normal Raspberry Pi. Prepare an SD card as you would normally, and boot the system. The result should be the same login dialog leading to the same main windows you expect to see with your system. The absence of an Ethernet port means you'll probably need either a wired Ethernet or WiFi dongle, unless you plan on connecting through SSH or the GPIO. We had significant issues trying to get the networking to work consistently. Although these problems weren't a direct result of bugs in the Pi Zero, the fact that we weren't able to use our first option for the local network (wired Ethernet) forced us to scramble for an alternative, and we ran in to some documented issues related to the available Comfast WiFi dongle. Another documented Raspberry Pi issue that becomes critical with the Pi Zero: better to avoid a back-power USB hub. The Pi Foundation points out the 1GHz ARM11 core is 40 percent faster than the 700MHz RPi1 models, but if you've gotten use to your quad-core RPi2, with its spacious 1GB memory, you'd better get ready for some waiting. Table 2 shows the boot time and the time to open a few common applications for a Raspbian "Jessie" system running on the RPi1B, RPi2B, and Pi Zero. As you can see in Table 2, Pi Zero performance is roughly comparable, and even slightly superior, to RPi1B performance; however, the RPi2 with its quad-core processor and 1GB blows away the Pi Zero for these simple tasks. Of course, opening desktop applications is not the forte of the Pi Zero. Mileage may vary for GPIO applications or SSH sessions running through the free USB port, but it is a safe bet the Pi Zero is slower than the RPi2B but as fast or slightly faster than the RPi1B. 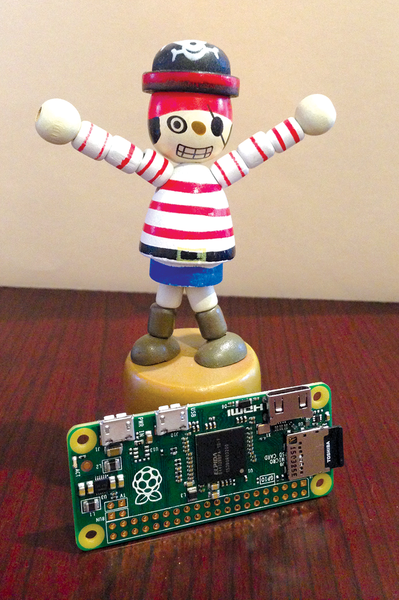 The Rasp Pi Zero comes with minimal equipment. To build it out, you will need an OTG adapter plus a USB hub. Makerspot has an interesting solution for this.